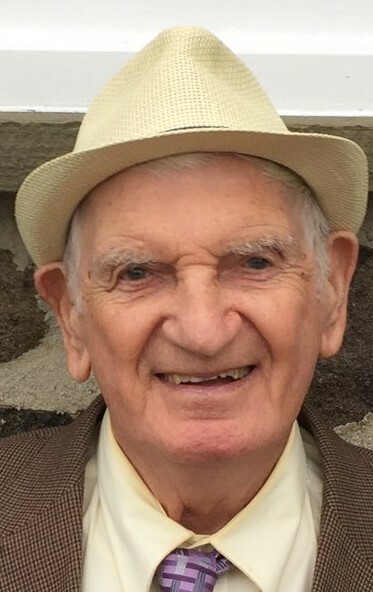 Obituary for Raymond F. Bender | Dimon Funeral Home and Cremation Services, Inc.
"He meant so much to so many, but was the world to us"
Raymond F. Bender, 93, of Kalmia Road, Tower City, passed away Monday afternoon, April 1, at his home surrounded by his loving family. Born in Kalmia on November 14, 1925, one of 18 children to Oley and Mamie Schaffer Bender, he was a World War II Army Veteran. Raymond began working as a coal miner and later worked for Daub’s Transportation, where he was a truck mechanic and a school bus driver. He also drove school bus for Jecks Service Center. Raymie spent almost 50 years driving school bus. He retired as a foreman from Budd Company, Lebanon. Following retirement he founded one of the first bottled water businesses, Stoney Mountain Springs, Tower City. He was a former member of St. Peter's Lutheran Church, Reinerton, where he was a Sunday school teacher and Luther League Leader. He was a current member of St. Peter's United Church of Christ, Orwin. He was also a member of the Swatara Lodge, F&AM, Tremont, and the Orwin and Muir Fire Companies. He was preceded in death by his parents and 14 siblings. His wife of 58 years, Dorothy (Dottie) Lebo Bender, passed away in 2005. Surviving are his son, Gary Bender and wife Melissa, Tower City; three daughters: Dr. Janice Minetola, Hanover; Jill Schade, Tower City; and Julie Bender, Dauphin; his companion, Ethel Behney, Tower City; three sisters: Dottie Lebo, New Cumberland; Anna Yiengst, Cleona; and Ruth Mence, Florida; 7 grandchildren and 4 great grandchildren. A Celebration of Raymie's life will be held on Friday, April 5, at 7 p.m. at the Chapel of the Dimon Funeral Home Inc., Tower City. Visitation will be from 6 p.m. to 7 p.m. at the chapel. Private burial will be in St. Peter's Cemetery, Orwin. In lieu of flowers, the family asks that you do a random act of kindness, something that Raymie and Dottie did all their lives. If you wish, you can post your act of kindness on the funeral home website. To sign the guestbook or list your act of kindness visit www.dimonfuneralhome.com.